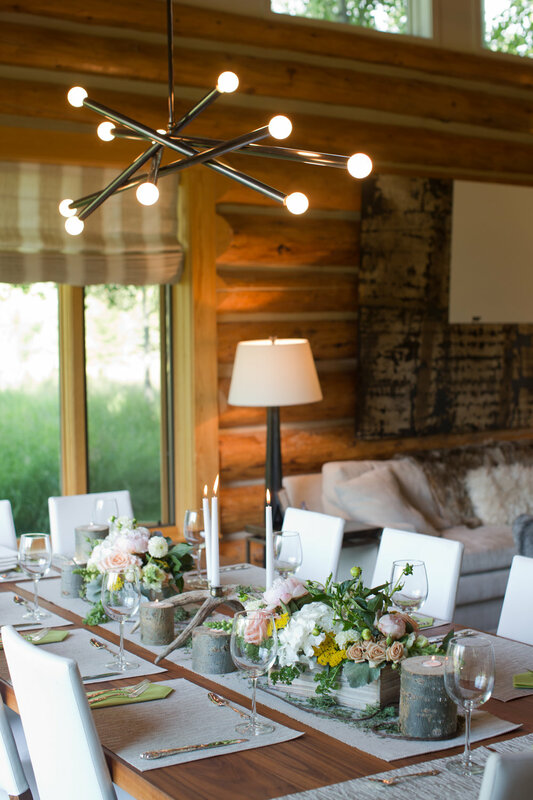 Planning a dinner party shouldn’t have you filled with angst so as Styling the New West, I penned “Easy Steps to Planning a Mountain Dinner Party” to HELP in this area. My job is to alleviate this angst and lay out details. Me, the Pinch Hitter.. Styling the New West and I’m all in and thankful you called! I am going to assume you are hosting a 12-person dinner party at your house connecting other couples that are visiting or don’t know each other. This is not an all out spread but want it to speak casual, fun and informal. Gather that list up and send an e-vite darling. It will keep track of your invite details, send reminders, set notifications when responses change, etc, Actually, I still believe in paper invitations BUT I know evite is more readily available. Kindly ask for a RSVP and you will get a committed party goer. So let’s talk deets…..So your top three easy steps are to Define a Theme, Think in Stations and Plan Make-Ahead Main Courses. Define a theme that speaks your style… casual, formal, bohemian this will give you a backdrop to create ideas and styling for your evening. Let’s call our theme “Summertime” and my 3 stations are cocktails and charcuterie, dinner party, cordials and conversation. Thinking in stations will construct flows for your guests, encourage more conversations, define your to-do-list will in turn fashion your menu breaking all of it down into bite size pieces. Cocktails and charcuterie. Here I have an assortment of rose wines, 4 types of liquor and mixers, some local brews and waters. It is plenty for 12 people and it gives an assortment for happy hour. Drinks are back in vogue so I like to have cocktails available before dinner. In my previous blog, “Charcuterie - Build the Perfect Board in 6 Steps.” I showed you how to put together a charcuterie board which is self serve and allows for more flow than servers serving appetizers. As a reminder, I like to purchase 4-5 assorted hard and soft cheese, 4-5 quality italian meats and 6 fillers such as figs, nuts, olives, etc being mindful of having breads and crackers and gluten free options. ALSO it is made up ahead of time and available the minute the guests get there. I’ve been to parties where the hostess made too many appetizers that needed to be heated up at the same time and she was in the kitchen while guests were milling. Be available to your guests darling! Details to think through….. Blue table runner I had on hand, blue wine bin, @tinafreydesigns champagne bucket and barware and wild flowers from the garden. Loose and easy but hey organized and easy to grab these antler wine glasses, horn bottle opener, cocktail napkins from @madejacksonhole It need not be complicated darling because you are using what you have, right? Of course you will set your table early in the day, as you pulled out your linens the day before to make sure they are cleaned and ironed and all will blend with your décor. I always have khaki linen, lime green and blue runners as well as matching napkins on hand so you can pretty much go in any direction. You will layer your tablescape so don’t worry about the exact pattern. Think of a standard table for 12 people as being at least 10 feet long so be prepared to have 2-3 floral arrangements, ordered early in the week, that are flat, sprawling and are neutral colors of white and green and splash of light pink. ( I don’t use yellow or purple flowers on the table if I can help it) I added some antler candlesticks, antlers and spread out moss to give it an earthy organic feel. Use your own dishware and silverware…. as long as it all blends. Table is ready to go. When you plan Make-Ahead Main Courses it will free yo up to entertain, set a comfortable setting for your guests and eliminate the need for extra hands. So, you’ll be working, grocery shopping and cooking the day BEFORE. For example, make up your entrée, baked chicken and scalloped potato strata and your spinach soufflé ahead of time. Prep your salad the day of but dress it and plate it right before you sit down to eat. All can be baking while you have a glass of wine!!! Right before you sit down, light candles and add butter, salt and pepper and pre-made up bread baskets. Enlist one of your guests to be the sommelier opening and pouring wine for the evening and one to help you place salads and serve the food…honestly your guests will love doing it! I have found most guests are watching their weight and I go light on dessert. Have several desserts made up ahead of time earlier in the week such as my Mini Coconut Lime Tartletts with Whipped Mint Fraiche from one of my previous blogs or JK’s Spicy Cheese Straws and some chocolate from Atelier Ortega. Small serve yourself dessert plates and napkins, ice bucket and some cordials set up in the living room such as sparkling waters, port or Wyoming whiskey in some real glasses, not plastic here. 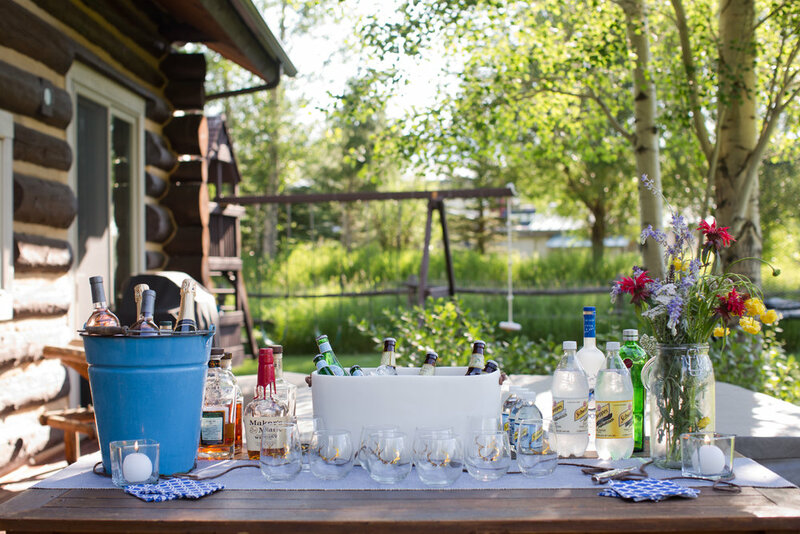 I don’t think you need to offer too many choice because your guests will find what they want, if it’s another glass of wine or beer from the outside bar. The main idea is to move your guests away from the table for more conversation. You’ve done it darling…. Save these Top 3 for your next dinner party….. Define a Theme, Thinking in Stations and Plan Make-Ahead Main Courses will ensure a beautiful night for your guests. Take the plunge, set a date and invite them over. I can’t wait to see your tablescape…. please send me photos to jillking@stylingthenewwest.com ! !